When I saw the trailer for this, I thought it looked like Ferris Bueller meets Igby Goes Down (If you've never seen Igby Goes Down, rent it! It stars Kieran Culkin who delivers one of my all time favorite lines: "I'm drowning in assholes!" If that doesn't sum up my life, I don't know what does...)--and it is. As well as a bit of Rushmore and several other classic movies about high school and troubled teens thrown in to boot. The concept of a kid operating a psychiatry practice out of the boys bathroom (with "patients" talking about their problems ala confessional style via the bathroom stalls...) seemed like a smash hit. 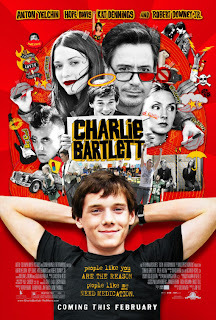 Unfortunately, Charlie Bartlett is not a cohesive homage to its more clever predecessors, but a mangled and derivative mess than is far less than the sum of its parts. Charlie is played by Anton Yelchin--who was terrific as the doomed Zack Mazursky in Alpha Dog. Here, however, he seems to be shamelessly channeling Matthew Broderick's performance of Ferris Bueller. Seriously, I would lay odds that Yelchin watched the John Hughes classic at least 100 times in order to copy the deadpan delivery and staccato and stilted speech patterns of the cocky but not quite to the point of smarmy Ferris. Understandably since it is Charlie's goal to become the Ferris Bueller of his high school--but while Ferris was cool and hip without effort, Charlie must resort to pimping out pharmaceuticals to attain his popularity. Or notoriety. They're interchangeable these days (See Hilton, Paris). Or maybe it was writer Gustin Nash who had the Ferris Bueller obsession. His screenplay straddles the line between quirky comedy and poignant teen drama. There are some moments that are quite touching and authentic, but unfortunately they get lost in the incredible silliness. For example, when Charlie is expelled from his latest private school his mother announces he'll attend public school. This is fine with Charlie, but he wants to take the bus because he doubts the other kids will arrive in a chauffeur-driven limo. A correct assumption--but why then have him stand and wait for the bus dressed in his prep school jacket and carrying an attaché case? Oh, wait--that's what Max Fischer did in Rushmore. But while Max was motivated by his abiding and undying love for his prep school, Charlie's motives aren't quite clear. Unless he wanted to have his facial features rearranged by the school bully.